A wee bike trip and a trot up a hill - Getting where? On Portobello Promenade, the goal in the distance. Since I’ve got this lovely bike now and I decided I wanted to use the next few months to enjoy Scotland, the incredible weather on Saturday seemed like a good time to start. 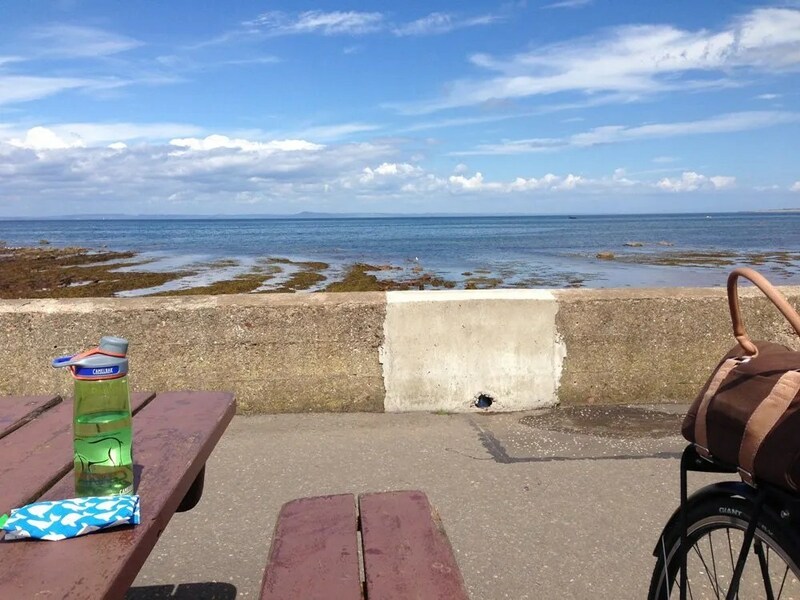 Due to a somewhat heated and ill-advised debate on Friday night, I had scads of frustrated energy to burn, so Saturday morning I packed a sandwich, sunscreened myself up, and got on my bike to ride to North Berwick which is 23 miles away. I’ve never cycled NEARLY as far as that in one go. I did about 10.5 on Tuesday night, and I think I did about 14 when I was at my parents’ house in October (but with a long beer and lunch break about halfway through) and that’s probably the closest I’ve come. But last year I walked from Prestonpans to North Berwick, and followed more or less the same route as I would be biking, so I knew what I was in for, and it’s not bad in terms of terrain. A few small climbs, but mostly flat and about half on bike paths, the rest on reasonably quiet roads. And sunshine or no, you can’t beat the views. Not too shabby for a lunch break. Google said it would take just under two hours. I took about three including a few short stops, so I think I did pretty well. I was originally going to go with some friends, but other plans happened and I ended up just doing it on my own. That was probably for the best, as I think I needed the time to have a few words with myself, and I also didn’t have to worry about my speed in relation to anyone else. And now that I know the trip, I can go back with people! My Steampunk coffee and cookie reward shot got some jealous reactions, and that is excuse enough to take another trip next time the weather’s good. There’s also a fish and chip van about halfway along the route on the beach outside Longniddry, and I’d love to try it out. It was a good way to get to know my bike better too. I’m still a little wobbly on it but I know what gears are cranky and what’s comfortable and how my brakes like to behave and all that. (And I finally decided its name is Alicia. Because The Good Wife. Obviously.) I’m not super happy about the Po Campo bag I bought, which I’d been excited about, but it doesn’t like to stay upright on the rack. It’s too much of a hassle to send it back to the US, so I just need to figure out how to modify it to make it work. Can’t win them all. 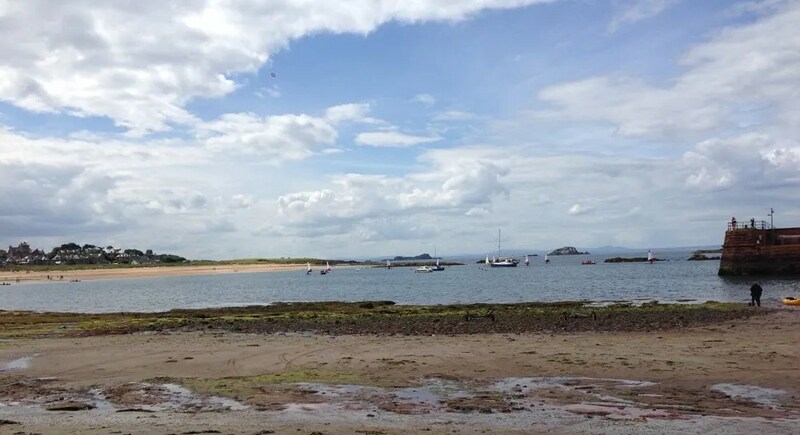 The beach in North Berwick, hooray! Anyway, once I’d had a bit of a walk round North Berwick and along the beach, I headed to the station to get the train home. And somehow I still had a lot of energy, so I went with my friend Katie round the back of Arthur’s Seat for a drink at the Sheep Heid. After which we ended up going nearly all the way back up the hill, sort of by mistake, but it was a good scramble. It was the first outing of the new hiking shoes I bought for our trip to Glencoe next month too, so there was some proper breaking-in going on. It was such a lovely evening and I didn’t get home until about 10.15, which is one of the nicest things about summer in Scotland – you can be going up hills at 9 at night and still have plenty of light to do so. I was certain that after all that activity I’d be screaming in pain when I woke up this morning, but since I finally remembered to stretch properly before bed, I’m more or less fine. It felt really good to just run myself ragged all day. I think I’m finally so fed up of sitting at a computer all the time that my appetite for escape is like a perpetual motion engine. Dancing, cycling, going up hills. There’ll be plenty more of that.